The broader consensus on K-drama Goblin was that the second lead couple was way more romantically gripping than the first leads as a couple, and now the second leads are coming back elevated to headline their own K-drama. 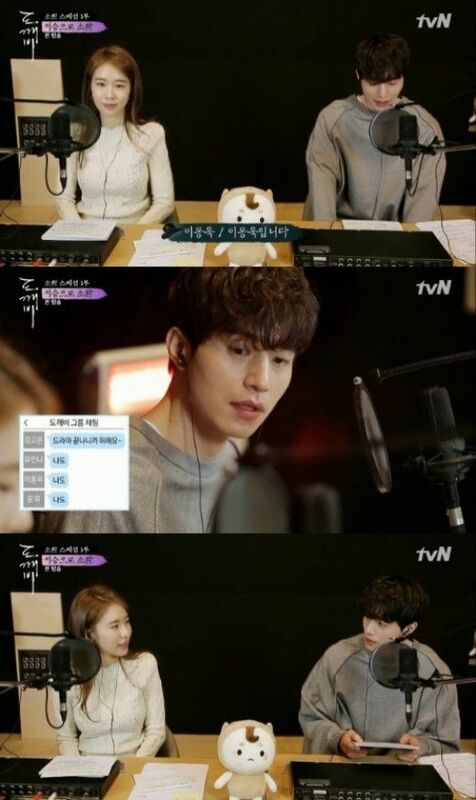 Yoo In Na and Lee Dong Wook have been offered the leads and are as much confirmed per media reports for upcoming rom-com Touch Your Heart adapted from a webtoon and from the PD of Why Secretary Kim. Earlier it was reported that Jung Kyung Ho was considering the male lead and I was on board with that but am all over the male lead switch to Lee Dong Wook solely for it reuniting him with Yoo In Na. She plays a top actress dealing with a scandal who goes undercover as a secretary for a top lawyer played by Lee Dong Wook. I’m thrilled its taken less than two years to get these two reunited onscreen and look forward to their second go-around, or fourth if you bake in their three reincarnations in Goblin. I don’t think so. I think when the role was offered to JKH, YIN was going to be the main lead, which is probably the reason why he declined. There’s no reason for him to play second fiddle to YIN when he was even top-billed over Kim So-yeon in Falling for Innocence. Now that it’s offered to LDW instead, perhaps they’ll change the plot to focus on the male lead more. I’m on the fence for their reunion. I liked them more than the main couple in Goblin and I think their story was epic and should be left at that. Goblin hype continues after 2 years. I want to see JKH return to dramaland soon, but i’m actually OK if he’s not on board. Imo, the secretary synopsis is not really exciting but given the writer maybe this will be hyped up just like WWWSK. I still have yet to finish Goblin, but I did definitely cared more for the second lead couple than the lead couple. So I’d totally be up for their reunion as main leads. Hmmm lets see🤔🤔.I think it would ha e been interesting to see Jung Kyung Ho in a rom com after a string of thrillers and police dramas.But again, no need to worry about him.He knows how to choose his scripts.Il just look forward to what he will put out next. As for these two, Lee Dong Wook is a good looking man but I find him very bland as an actor especially when he is the main lead.I think his eyes are his acting strength but also his greatest weakness.As for Yoo In Na, I already said my thoughts about her as a lead actress in the other post, no need to repeat myself.But the good news is that these two had good chemistry in goblin and thats what is needed for this kind of drama to work.The roles are also something both have done before.Yoo In Na is playing an “actress” role for the third time.Lee Dong Wook has also played a chaebol role, multiple times.So I think they will do ok.But frankly speaking, the drama would do well.But I dont see this surpassing WSK in ratings or buzz. I was actually looking forward to JKH in this one. While the Goblin second lead pai was popular not too excited about the reunion. Don’t know just find LDW acting rather lacklustre. if Jung Kyung Ho is dropping this drama, I will gladly accept it. Tired of him choosing bad rom com as his project. And I’m not a fan of this PD either. Maybe if he choose this, he will rise to fame i suppose. Since rom com is not something require great acting skill unless the writers is someone like Park Yeon Seon ar Park Hae Young. so both of them will be okay. I prefered Jung Kyung Ho ! I liked the second couple in Goblin, but not to the point to want a reunion of the actors. I prefer see new pairing. I need JKH in black comedy drama or a comedy crime drama. His romcom dramas didnt really do well. But hold on, i like Falling For Innocent, is it a romcom? Hmm..
Im really looking forward to this drama… I find the plot more like a continuation story of their second lives in goblin… It felt like they wanted the roles.. I hope they wont back out. Lee dong wool handsome and tall but he can’t acting, life drama was pretty boring because of him.